We were in a mood for a different breakfast to break the monotony of home weekend breakfast of eggs and pancakes. But the last week was so cold that the idea of going out for breakfast/brunch in the freezing weather wasn't appealing either. I had to think quick on my feet, check if we had all the ingredients and then decided to make something different. 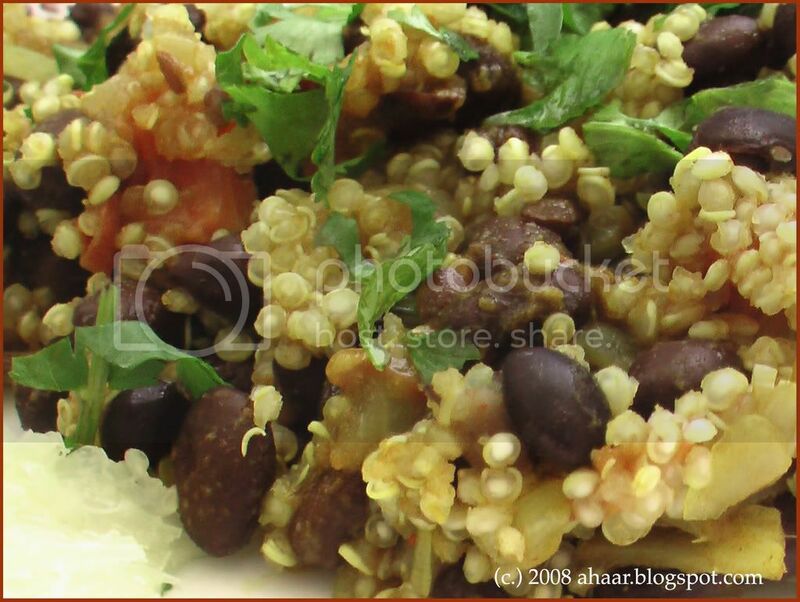 It was savory quinoa - an ancient grain which has been described as superfood full of all the right ingredients - with black beans, tomatoes and onions. It was a delicious taste which warmed us with a new taste. And it was easy and quick. While the quinoa was cooking in the microwave, I put the black beans together with onions and tomatoes. The dish was ready in 30 minutes! Cook the quinoa according to the box options. Usually it is 1:2 ratio of grain and water cooked up to 8-10 minutes. In a saucepan, heat oil and temper it with cumin seeds and the green chilli. Then add the onions and saute for a couple of minutes. Then add the tomatoes and let it cook for 1-2 minutes till they turn soft but no squishy. 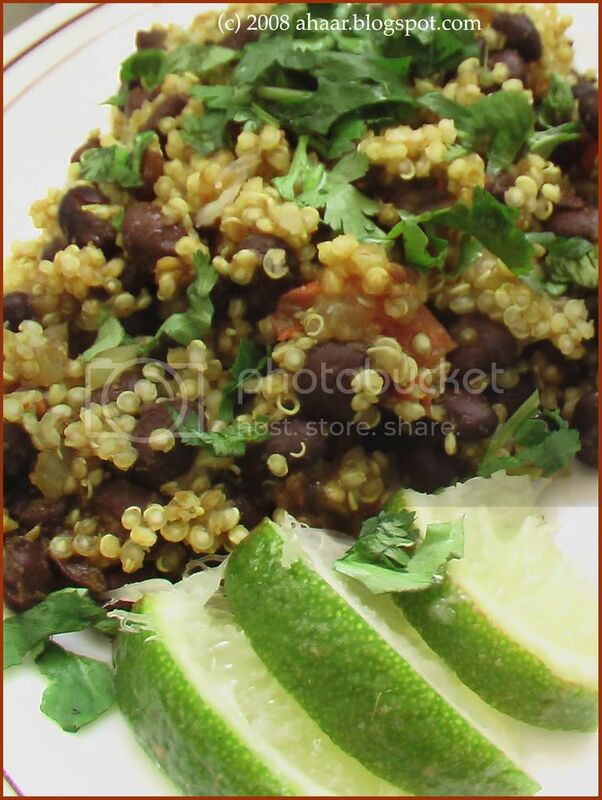 Add the black beans, coriander powder, salt and pepper and let it cook on closed lid for another 2-3 minutes. Then add the quinoa and lime juice and mix it all together. Garnish with cilantro and serve warm for brunch/breakfast with some hot coffee or tea. This week's edition of Coconut Coast, a show in which U.K-based chef and restaurateur Reza Mahammad travels around Kerala showcasing the region's spices and cuisine, featured a seafood dish that was simply too tempting to just watch on TV - pan fried fish with a marinade of roast onions, ginger, garlic, curry leaves, and green chillis! So we picked up some wild caught white bass and decided to try it right away. And what's more, this recipe from Cochin is a wonderful reminder of the many cultures that have shaped cuisines and taste cultures over the past several centuries. As Sunitha, the cook on the show, explained to Mahammad, this is a jewish specialty that a long-time resident and cook in the Jew town section of Cochin taught her. And on a slightly academic note, the show brought to mind Ashis Nandy's wonderful essay on Cochin as a city in which "precolonial traditions of cultural pluralism refuse to die" (link), a city that is defined by the intermingling of influences from China, Africa, Southeast Asia, West Asia, and Europe. Here, then, is the recipe for a jewish-keralan take on seafood! The cook on the show called it Chuttili Meen, chuttili being the roasted onion marinade (those of you who might know the correct name, does this sound right? Pl leave a comment). Mix some salt with lemon juice and rub on the fish - this keeps the fish fresh and gets rid of the "fishiness" - and set aside. In the meantime, heat some oil in a pan and roast the ginger, garlic, green chillis, curry leaves, and chopped onion. Grind all this with lime juice and salt. Rub the paste over the fish fillets. You don't have to keep the fish marinade for long. 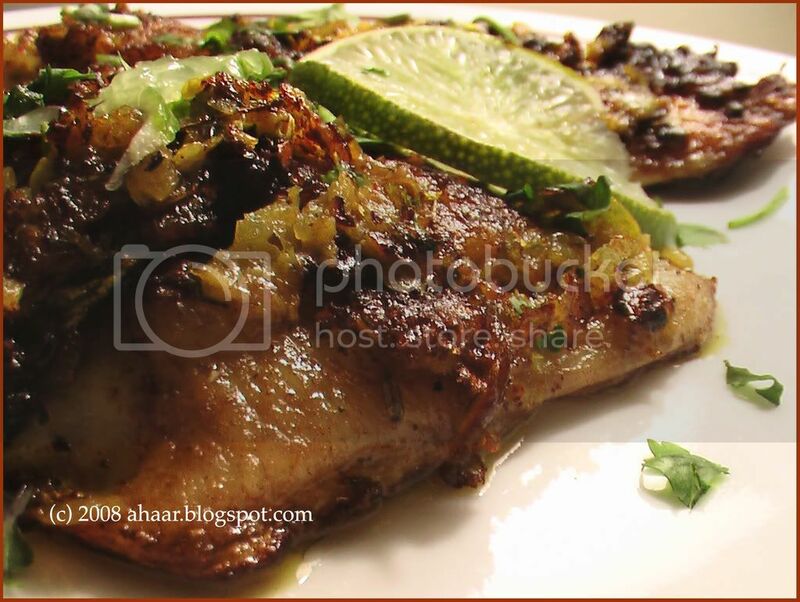 Pan fry fish till the translucency disappears. 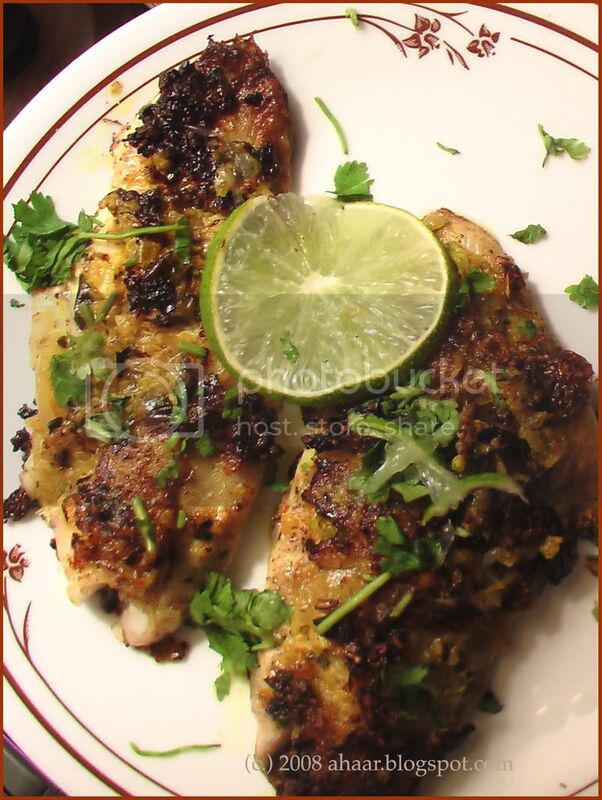 Garnish with cilantro and lime and serve with rice and dal. This is our entry for JFI: Onions hosted by Radhika at Radhi's Kitchen. And for RCI: Kerala hosted by Jyothsna at Currybazaar. 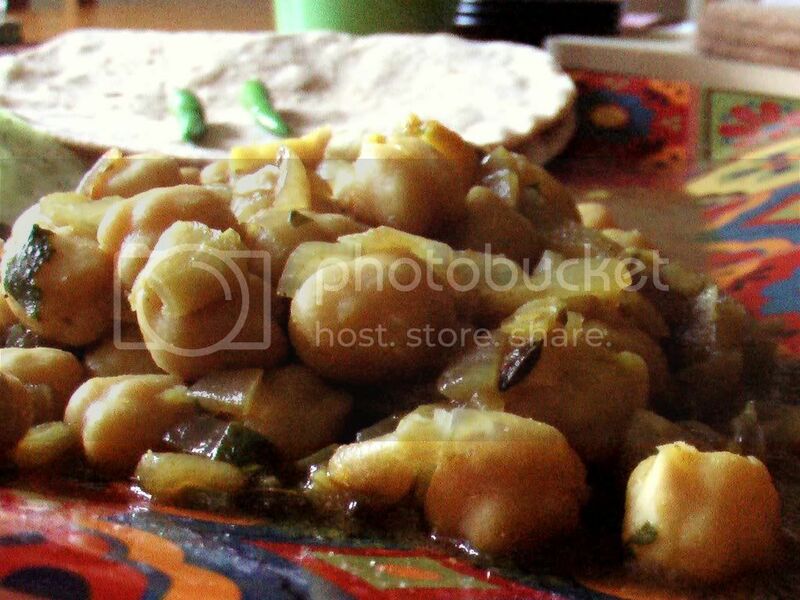 When I soaked some chole this weekend, I didn't want to make the same old chickpeas curry. I was in the mood to try out some new recipe. So I looked around and came this recipe in Bawarchi. "Tea bag," I said, when I looked at the recipe. But I realized that it was a good idea when I looked at the dark brown color of the curry. Instead of adding tomatoes I added some tamarind paste and enjoyed the sweet and sour taste of the curry. After adding the tamarind, I omitted the aamchur (mango powder) and anardana (pomegranate) seeds. 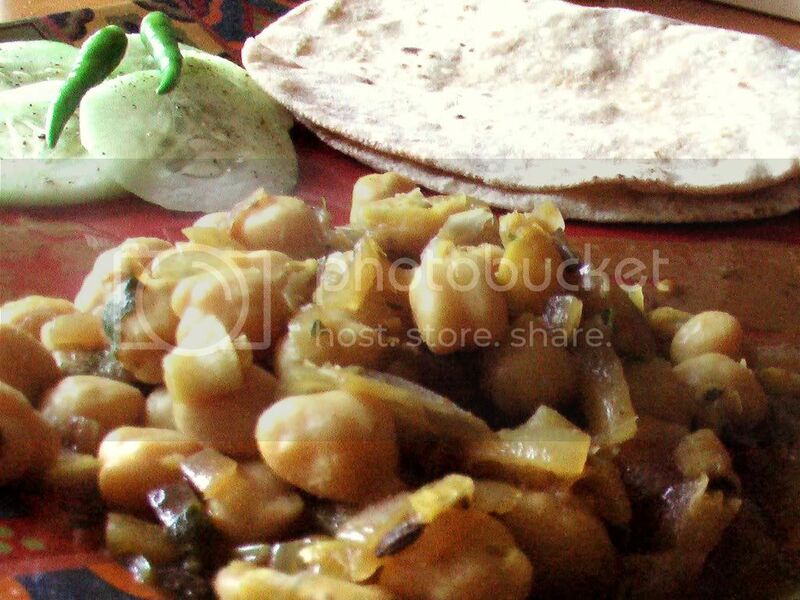 Soak the chole overnight and boil it with a tea bag, salt and black cardamom. Discard the teabag and keep the water for the curry. In a thick bottomed pan, heat oil and temper it with cumin seeds and red chilli. Add bayleaves, green chillies, and ginger and saute it. Then add the onion and fry till they start turning brown. Then add the tamarind paste, cooked chole, the other dry masala and cook it all together for about 8-10 minutes. While cooking I mash some of the chole to make the curry thicker. Garnish with fresh chopped cilantro and serve warm. 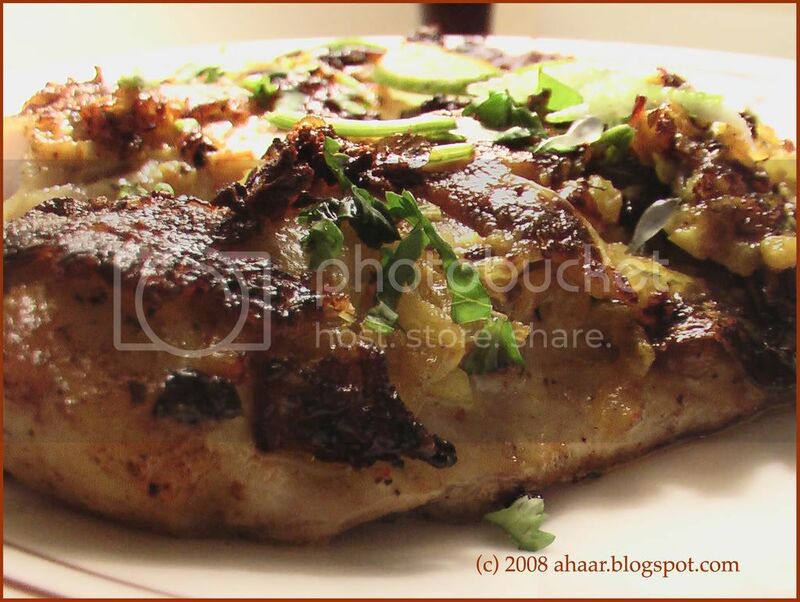 We enjoyed ours with roti and cucumber salad. PS: I just found out about the Legume Love Affair event and am sending this to Susan at The Well-Seasoned Cook. 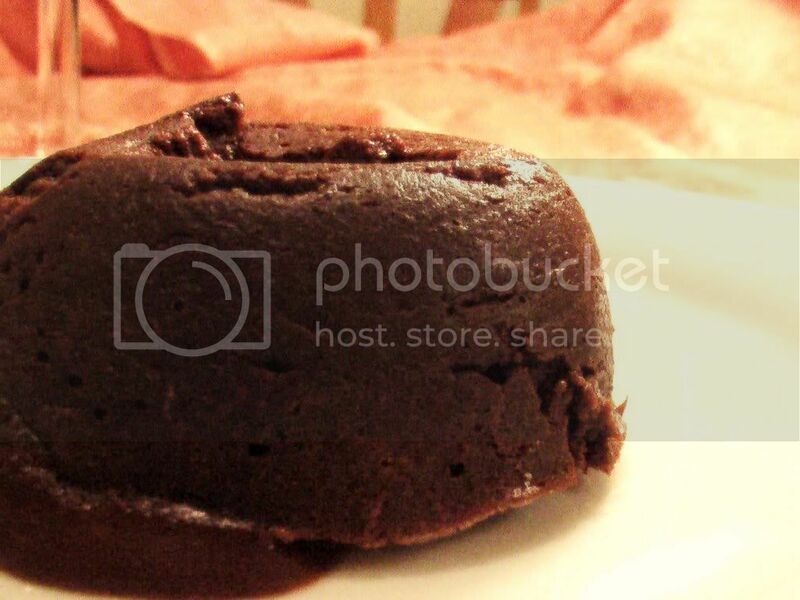 It was a balmy October evening couple of years ago when I had my first taste of this French classic - Moelleux au Chocolat. 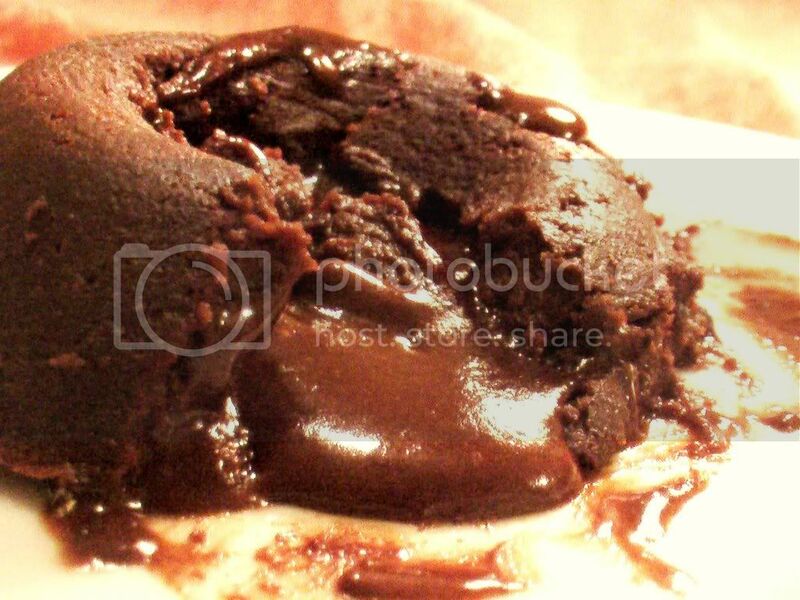 After a nice Durga Pujo bhog dinner my friends and I, in mood for dessert, walked into a restaurant and ordered chocolate lava cake. Served with a scoop of vanilla ice-cream, this mix of molten chocolate and cake took me by surprise. Needless to say, we finished it in record time. And from then on I have been wanting to try it at home. So when JFI: Chocolate rolled in, I decided to take my chances and try this at home. I was surprised by how easy it was and the taste of the chocolate lingers long after you have finished the cake. Melt chocolate on low flame in a double boiler or in a microwave. When melted, stir in butter and stir till it melts. In another bowl, beat the eggs and sugar till it mixes well and becomes frothy. Now stir in melted chocolate and butter. Then add flour and mix everything together. Butter 4 individual ramekins, and pour in chocolate batter. Then bake it in the oven for about 10 minutes till the rest of the cake is cooked but the center is still soft. Take it out of the oven and turn the ramekins upside down onto dessert plates and serve warm. We enjoyed ours as is with some shiraz. 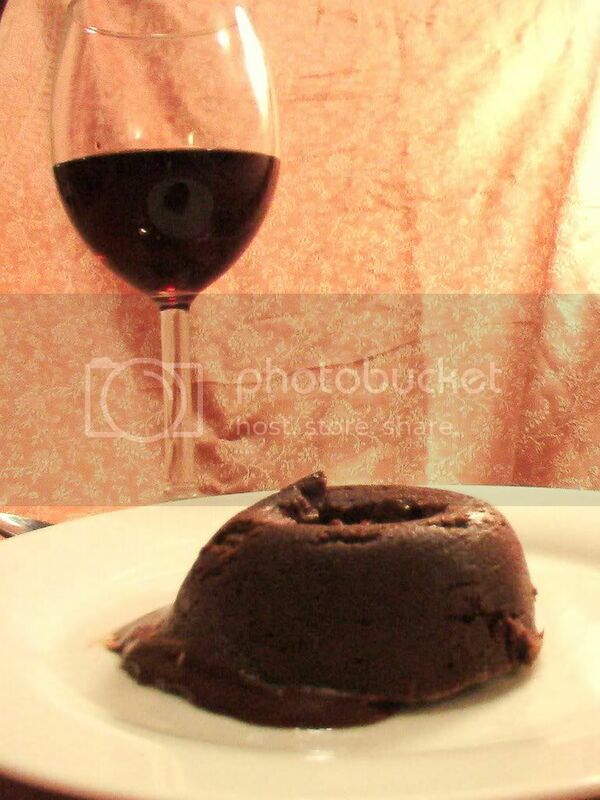 This is my entry for JFI: Chocolate hosted by Deepz at Letz Cook. JFI is the brianchild of Indira at Mahanandi. This is especially for a friend I have been luring to come visit us. A, another reason to visit us? Bet that got your attention. Yes, we are talking about the invisible ingredient we use in our cooking everyday - Heat! Recently, The New York Times had a great article on heat and cooking and how it changes the ingredients to create something new.